Stanford G. Wolfson, the son of George E. Wolfson, was born on February 23, 1922, in University City, Missouri. 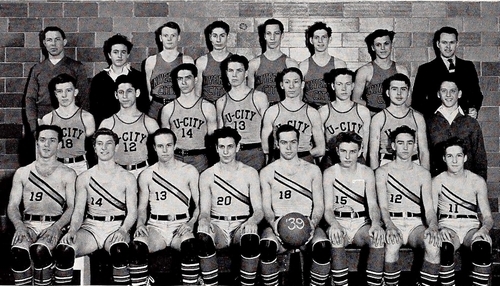 After attending University City High School, he entered the University of Illinois in 1939 and signed with the St. Louis Cardinals' organization in late 1940. He began his professional career with the Cooleemee Cards of the Class D North Carolina State League in 1941, but after bat ting just .172 over 14 games, he joined the Johnson City Cardinals of the Class D Appalachian League. Wolfson's hitting found its stride at Johnson City and he batted .303 in 45 games as a utility player seeing duty in the outfield, infield and on the mound. Still attending the University of Illinois, he started the 1942 baseball season with the Union City Greyhounds of the Class D Kitty League, but batted just .167 in 21 games and was back with Johnson City where he hit .268 in 88 games, earning a place on July's Appalachian League all-star team as a utility player. Wolfson entered military service on October 15, 1942. He served with the Army Air Force and trained as a bomber pilot. He was commissioned a Second Lieutenant in November, 1943, and received further training as a Boeing B-17 Flying Fortress pilot. In December 1943, he was assigned to the 335th Bomb Squadron of the 95th Bomb Group, Eighth Air Force, and deployed to Horham Airfield in Suffolk, England. Wolfson completed nine bombing missions over enemy territory and on November 5, 1944, he was co-pilot on a B-17G (#43-38814) heading to Ludwigshafen, Germany. The bomber successfully dropped its payload on the target but was badly damaged by anti-aircraft fire. The pilot, Second Lieutenant Richard H. Wright, Jr., gave the order for his crew to bail out and Wolfson was seen safely descending by parachute. But that was the last his crewmates ever saw of him. The pilot, together with the bombardier who had not bailed out, nursed the crippled bomber back to France, where it managed a belly landing near Nancy. The rest of the crew had parachuted to safety - albeit captivity - near the Pfalzer Wald forest about eight miles southwest of Kaiserslautern, and met with a hostile reception from local civilians before being turned over to German authorities. Wolfson, of Jewish extraction, handed himself in to local civilians and was picked up by members of the Criminal Police from Kaiserslautern. On the journey to Kaiserslautern, in a wooded area on the outskirts of the city, he was murdered by his captors. Presumably because they had discovered he was Jewish. It was not until after the war ended that the fate of Stan Wolfson was discovered. "He was a jewish boy but didn't look it," said one of his crew members after the event. "I last saw Stan ... when we bailed out together. People in this territory [Kaiserslautern] were very hostile and since I was beat and threatened by a mob, it seems logical to me that he was murdered." Stan Wolfson was posthumously awarded the Distinguished Flying Cross, Air Medal and Purple Heart. In 1947, his murderer, named in documents as "Albert N." was tried before a General Military Court at Dachau, and was given a life sentence. Wolfson was buried in a Kaiserslautern cemetery, but in 1949 his remains were exhumed and returned to the United States. He now rests at the Chesed Shel Emeth Cemetery in University City, Missouri. A brass plaque on the Wall of Memory at United Hebrew Congregation, Chesterfield, Missouri, was purchased by the family to memorialize Stan Wolfson. His name is read aloud (along with other names whose plaques have also been placed) in memory each year on the anniversary of his death. 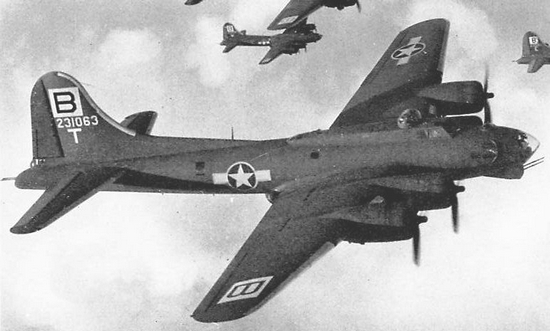 A B-17G of the 335th Bomb Squadron. 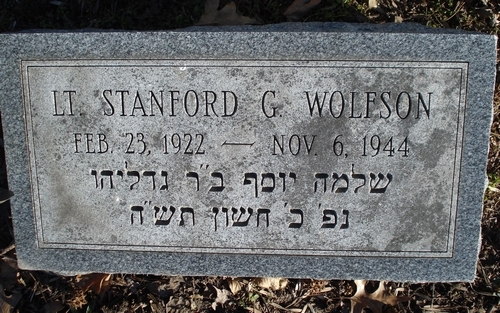 Stanford Wolfson's grave at Chesed Shel Emeth Cemetery in University City, Missouri. Thanks to Astrid van Erp for help with photos for this biography. Date Added May 29, 2012 Updated July 31, 2017.